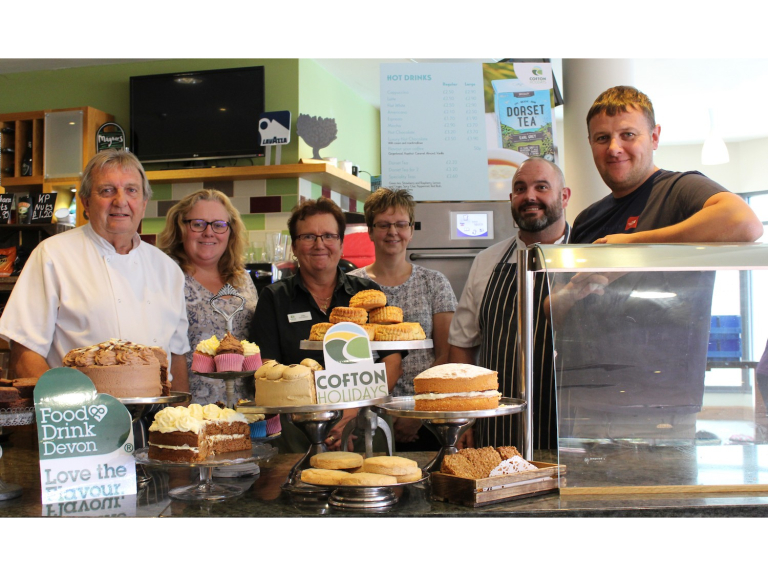 Amelia’s Café at Cofton Holidays, near Dawlish, South Devon, has been shortlisted as one of just three finalists in the Best Café category at the Food and Drink Devon Awards 2017. Whittled down from 65 entries in the Taste of Devon Hospitality section of the awards, Ameila’s Café has been recognised for its commitment to delivering a menu that boasts great dishes, founded on locally sourced food, designed to fit the expectations of Cofton’s clientele and price point. Popular dishes include Devon belly of pork, Devonshire burgers, homemade korma, Devon lamb breast and fish & chips. Open 363 days of the year, serving breakfast, lunch and dinner, Amelia’s Café prides itself on the variety of dishes served, accompanied by a selection of local beers and ciders, fresh coffee, Dorset Tea and a selection of homemade cakes. Diners can see the location of all local suppliers on the Amelia’s Café menu, which includes beef from Robert Cotton’s South Devon herd of cattle. Grass fed and slow reared on fields that include meadows within Cofton’s 80 acres of parkland, individual animals are selected for Cofton. Meat is hung for between two and three weeks and whole joints are cut into steaks at Cofton. Topside is used in the carvery and beef is also set aside to make over 500 fresh burgers for use in the café. Suet is used for dripping and all the bones are used to make gravy. Among Amelia’s Café’s other suppliers are Ryders family bakery in nearby Kenn; Forest Fungi in Dawlish Warren; M. C. Kelly from Copplestone who provide lamb, pork, beef, cheese and Eslton Farm sausages; Sandford Orchards, who provide a selection of draught ciders; and Red Rock Brewery who supply their Devon Craft Pilsner. Local fruit and vegetables are sourced from the Exeter area, and eggs come from Devon Egg, Linhayes. Commenting on Amelia’s Café’s shortlisting, Chris Jeffery, Director at Cofton Holidays, said: “We pride ourselves on sourcing outstanding local produce to create truly tasty dishes. It’s great to be able to demonstrate what produce is available on our doorstep. The closer we can source quality produce, the better. “From fresh beef raised on our own fields to Brixham fish landed and with us on the same day, we go the extra mile to ensure our guests get a real taste of Devon. That’s important as we have over 80,000 guests on site every year from across the globe. Barbara King, Chair of the Board of Directors at Food and Drink Devon, commented: “It’s been a busy few months completing the exciting task of judging the Food & Drink Devon Awards and this year we’ve had a record number of entries. This year the Food & Drink Devon Awards ceremony will be hosted by food and drink expert and BBC broadcaster, Nigel Barden, at the Deer Park Country House Hotel, Weston near Honiton on 9 October.